PA media claims man, identified as Hamas terrorist, killed in explosion in northern Gaza Strip. Three others injured. 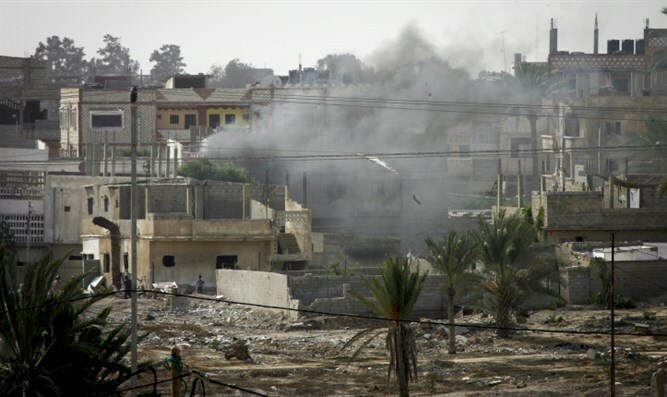 One person was killed and three more injured in an explosion in the northern Gaza Strip Monday morning. Arab media outlets reported that the explosion occurred in the town of Beit Lahiya. Health officials in the Hamas-ruled Gaza Strip identified the man killed in the explosion as 55-year-old Mohammed Nimr Maqadmah. A member of the Hamas terror group’s military wing, it is unclear if Maqadmah was killed in a targeted killing, or in an accidental explosion while building a bomb. Local media outlets initially claimed the explosion was the result of an Israeli drone attack, but subsequent reports by Arab news sources suggested the explosion may have been an accident. Three other people were injured in the explosion, one of which is reportedly Maqadmah’s son. On Sunday night, a Hamas terrorist from the Al-Qassam Brigades was killed during a tunnel collapse in the central Gaza Strip. The terrorist was identified as 33-year-old Tha’er Nayef az-Zare’ey. A day earlier, Fadi Mohammad al-Batsh, a 35-year-old engineer and Hamas member, was killed by two suspects believed to have ties with a foreign intelligence agency in a drive-by shooting on his way to dawn Muslim prayers.